Top reasons with simple ways to start incorporating beans into your weekly routine! This may seem like a no-brainer since most chili recipes call for beans. When making chili, try cutting the meat portion in half and doubling the beans. Or better yet, omit the meat completely and opt for a vegetarian chili with a variety of beans. Beans are very hearty, and I guarantee you won’t miss the meat in this low-calorie, filling dish. Mexican food is quick and easy to prepare and usually includes beans and veggies. Black beans are a great addition to tacos, burritos, or quesadillas. One of my favorite Mexican-inspired dishes is sweet potato and black bean quesadillas. To make this delicious dish, roast cubed sweet potatoes in the oven for about 30-40 minutes at 400 degrees until tender. Meanwhile, sauté some minced white onion, minced garlic, and cooked beans in a dash of olive oil for a few minutes in a skillet. Season the onion and bean mixture with a dash of salt, cumin, and chili powder. Once everything is cooked, sprinkle a little Mexican cheese on a whole wheat tortilla, then top with the cooked sweet potatoes and the bean mixture. Top with a second whole wheat tortilla and use a press to grill it all together (I use a Foreman grill, but you can also use a Panini press or a regular skillet to brown the tortilla). This recipe will please everyone, even meat eaters! Here’s a tasty bean enchilada recipe to cook with the kids. Making a good veggie burger is an art. Sometimes the patties don’t stick together, while other times they are too mushy. The secret to the perfect veggie burger is adding mashed beans to the mixture. Beans hold the patty together, provide protein and fiber, and give a nice consistency to the patty. Search the internet for black bean or chickpea burger recipes, and you may be pleasantly surprised! Did I lose you yet? Hold on: you may be bored by bean dips, but they can be interesting, delicious, and simple to make. Almost every bean dip starts with a can of beans, olive oil, and garlic pureed together in a food processor. Then other ingredients are added for flavor, such as lemon juice, tahini, and parsley. Try experimenting with beans that you may not eat often, such as black-eyed peas or white beans. Bean dips can be prepared in minutes and are a great substitute for mayo on sandwiches, a healthy addition to school lunch boxes, and a nutritious afternoon snack. 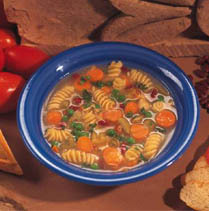 A number of soups include beans or have bean bases. You may not even realize that some of your favorite soups contain beans, such Pasta e Fagioli, Minestrone, Black Bean Soup, and Ribollita. Many vegetable soups also include beans as well as a large serving of vegetables, making them a lunch that is high in fiber and protein and low in calories. If you often buy lunch during the workday, these soups are a great option for a lunch that is filling and healthy. Check out more easy soups to make with your family. Add beans to a salad. A salad is another great option for a healthy take-out lunch. Most lunch spots have salad bars where you can build your own salad. Adding chicken to a salad can make the price soar through the roof. Instead, try adding beans for a cheaper and lower-calorie protein alternative. Chickpeas, black beans, and white beans add great texture to salad, and you will appreciate the money and calories you save. “Breakfast burrito” is just a fancy term for an egg scramble eaten burrito style in a tortilla. Luckily, this means that you can put anything you want in your breakfast burrito, including black beans. A breakfast burrito is a substantial breakfast that can be loaded with veggies and protein. Start by sautéing peppers and onions in a splash of olive oil for about 5 minutes. Then add black beans and eggs. Roll up in a whole wheat tortilla with some shredded cheese and salsa and enjoy! A bean salad is a lettuce-less salad with a variety of beans and vegetables. These salads are great because although they are dressed when made, they will not get soggy. Generally the beans will soak up the dressing the longer they sit, and the flavor intensifies. 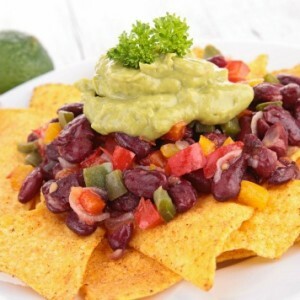 As with all the other bean dishes, these types of salads are low in calories and high in fiber and protein, making them very filling and nourishing. See more bean and salad recipes. Use any of tips 1-8 to make your Monday night family meal meatless. Try doing this every Monday to start the week off on a healthy note! This may seem like the scariest tip, but beans can actually be added to some of your favorite desserts. Black beans added to brownies results in a moist and decadent treat. Try this flourless brownie recipe from Whole Foods Market for a protein-packed dessert (https://www.wholefoodsmarket.com/recipe/flourless-brownies). *When using canned beans, rinse thoroughly in a colander to remove any excess sodium. Natalie Rizzo has a Master of Science in Nutrition and Exercise Physiology from Teachers College, Columbia University. While in school, Natalie works for Veggiecation, where she conducts healthy kids cooking classes and teaches nutrition education to children. Natalie is also passionate about living a healthy and active lifestyle, and she works for a Board Certified Specialist in Sports Dietetics (CSSD). 1. How can I still eat a hearty meal packed with protein but without all the calories from meat? 2. 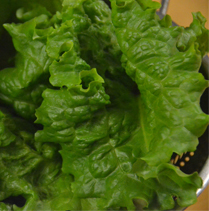 What contains the most concentrated form of plant protein in the world?